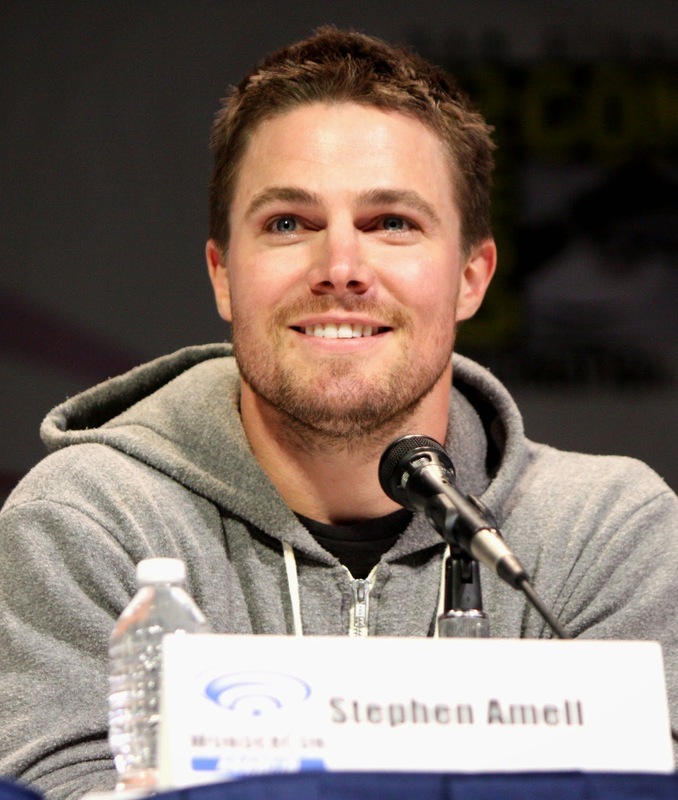 Hitting the webs right before April Fool's Day was the announcement that former Hung, almost Spartacus and current Arrow Oliver Queen Stephen Amell would be donning the hockey mask to play the beat'em up vigilante Casey Jones in a sequel to Paramount's hit reboot of Teenage Mutant Ninja Turtles from 2014. That flick, produced by Michael Bay had many a fan treading cautiously to the theaters but surprisingly delivered a fast, fun and of course, action packed time at the movies and grossed $464 million bucks worldwide. While the Turtles' CGI avatars and freakish size coupled with Splinter's seemingly unfinished appearance was a little jarring, overall the movie didn't take itself too seriously and had a few laughs along with brotherly rabble rousing. It was weird that Splinter learned the art of Ninja from a book but I guess it's not any more far fetched than a pet rat mimicking his masters movements from his cage like in the 1990 movie. Amell has starred on 3 seasons of CW's hit show Arrow where he plays a stern and physical vigilante aiming to clean up his city through martial arts and archery. According to Variety Amell was among half a dozen Casey hopefuls but his chemistry with star Megan Fox sealed the deal. The casting came as a surprise to some but not much of a shock to me. Here's a guy already known to the comic book world who plays a vigilante already and probably didn't cost a fortune. With Warner Brothers not enlisting Amell for any big screen DC outings, more power to him for landing in another comic book based, fancentric franchise. I had seen Amell on Hung opposite former The Punisher Thomas Jane where he starred as a dim yet studly competitor to Jane's "happiness consultant". After the unfortunate passing of Andy Whitfield, the in shape Amell was a finalist for Spartacus but lost out to Liam McIntyre. He does a solid job on Arrow at playing a Bruce Wayne-esque party boy along with a sullen anti-hero who says "Thank You" a lot. Like a lot, a lot. Throw a wig on him and let him go crazy and I think he'll do a solid job. Appearing in a Raphael one-shot in 1985 from Kevin Eastman and Peter Laird, we're introduced to Casey Jones in his crap filled apartment where he's watching cop shows and movies on three televisions simultaneously while lifting weights. Convinced that there's too much scum on the streets and not enough good guys, Jones picks up a golf bag full of bats, hockey sticks and clubs, dons a hockey mask and sets out to help the cops take on the bad guys. Breaking the leg of a purse snatcher, the overzealous Jones runs into Teenage Mutant Ninja Turtle and hothead Raphael who thinks this quest of justice has gone a little too far. The two battle for pages and pages finally coming to an understanding that no one deserves to die for stealing a tape deck. When the scream of a woman needing help catches both their attention, they dash off into the night to mete out some sports equipment and karate kicking comeuppance. Jones made his cinematic debut in the 1990 film along with Leonardo, Donatello, Michelangelo, Raphael, Splinter, April O'Neil and The Shredder. Played by Montreal native but New York and Acting Studio trained actor Elias Koteas, we meet Jones stalking some purse snatchers and beating their butts with a hockey stick. Like the comics, Raphael intervenes and the two go at it with fists, trash cans, flips, kicks, Jose Canseco bats, cricket paddles and constant quips. Koteas is pitch perfect as the physical and attitude dripping Jones in his action scenes and opposites attract romance with April (Judith Hoag). Koteas would go on to have a solid career in TV and film popping up in The Thin Red Line, Collateral Damage, Shooter, Shutter Island, The Curious Case of Benjamin Button and many more. Asked about his experience on the film and Koteas says he doesn't think about it much but remembers having fun playing a swashbuckling hero type and how it could take over a dozen takes to get the animatronic turtles right in a scene. Koteas returned to the role in 1993's present day and feudal Japan set part III. The role was voiced by The Human Torch and future Captain America Chris Evans in 2007's animated feature.